Trump’s ban against refugees from seven Muslim-majority nations has sparked acts of defiance in NYC, from demonstrations across town, to striking taxicab drivers at JFK to Middle Eastern bodega owners closing their shops in protest. 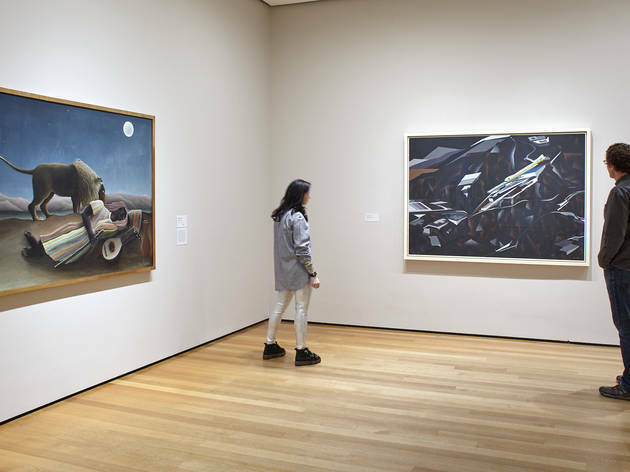 Recently, the Museum Of Modern added its two cents by bringing out artworks it owns from the affected countries, and hanging them prominently within the galleries usually reserved for 19th- and 20th-century artworks from Europe and the United States. Paintings by Picasso and Matisse, for example, were removed to make way for pieces by Tala Madani (from Iran), Ibrahim El-Salahi (from Sudan) and architect Zaha Hadid (from Iraq). 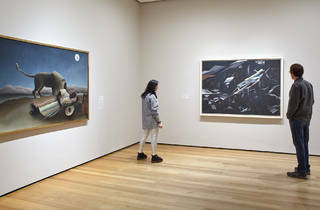 The rehanging, which was unannounced, aims to create a symbolic welcome that repudiates Trump by creating a visual dialog between the newly added works and the more familiar objects from MoMA's permanent collection. You can check out images of the exhibit below.